The Southern Ocean encircles the frozen continent of Antarctica. Winds are regularly gale force or stronger and, with no land mass to stop them, waves can reach terrifying heights. 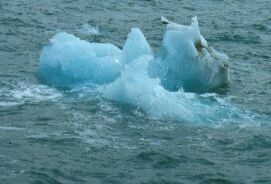 If this is coupled with water temperatures as low as -1.8°C and icebergs sometimes miles in diameter you could be forgiven for assuming that few things live there. In fact the Southern Ocean is one of the richest seas in the world. It's depths contain huge shoals of fish and squid, which in turn provide food for large numbers of birds, seals and whales. For a more in depth look at this highly efficient food web go to the science page. The size of the waves in the Southern Ocean dwarf even this 100 metre ice-breaking research ship. 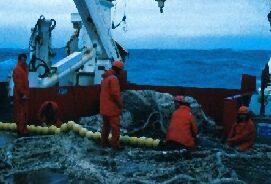 With slippery, wildly rolling decks and lots of trawl net about it is all to easy to lose your footing. You can only imagine what it must be like in a small yacht in these seas. The vastness and power of the Southern Ocean makes times of relative calm all the more special. 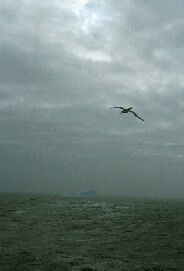 There are times when even the huge wings of the Albatross find it hard to catch enough wind for gliding. Such calm also makes it harder to spot icebergs and, in the days before reliable radar, calm weather in the Southern Ocean was at times considered more dangerous than rough. I found that one of the hardest things to do while onboard ship in the Southern Ocean was to capture its swings in moods on camera. 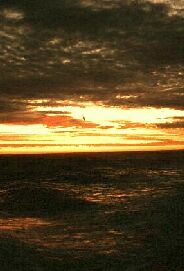 Its beauty is often overwhelming and I doubt if any picture could do the reality justice. I only hope that the pictures here and on other pages of this site give you some idea of its variety.